Even in the most organized homes, laundry rooms, mud rooms, there is usually that chaotic catch-all room where clothes, your kid’s crap, overflow kitchen pantry items, and just lots of random “do it later” kind of stuff gets dumped. Laundry and mud rooms, entry ways, kitchen counters, etc. are all kiiiind of like temporary holding tanks. They get full o’ stuff fast if you don’t make the time to deal with ’em. Putting a weekly “house review/reset” alarm scheduled in your smart phone (about 30 mins or so until you’re in the habit) is a good way to remember. I usually do this before my “Sunday Review”. It’s a great way to start the work week. First, we got rid of the stuff in the room that didn’t really belong there, like sporting equipment, kid’s school work/supplies, and dry pantry items. We re-purposed one of the shelves which now houses media in the new media closet under the stairs (a great place to store your surround sound and wireless devices). Another shelf, was posted in Austin Free Items on Craigslist (an awesome resource for donating items). Raymond at AmericanHandymanLC.com installed some inexpensive Ikea shelving units with doors. She went with the birch and shiny blue doors. Loooove it. Instead of door knobs, he is going to install small door tabs next week. 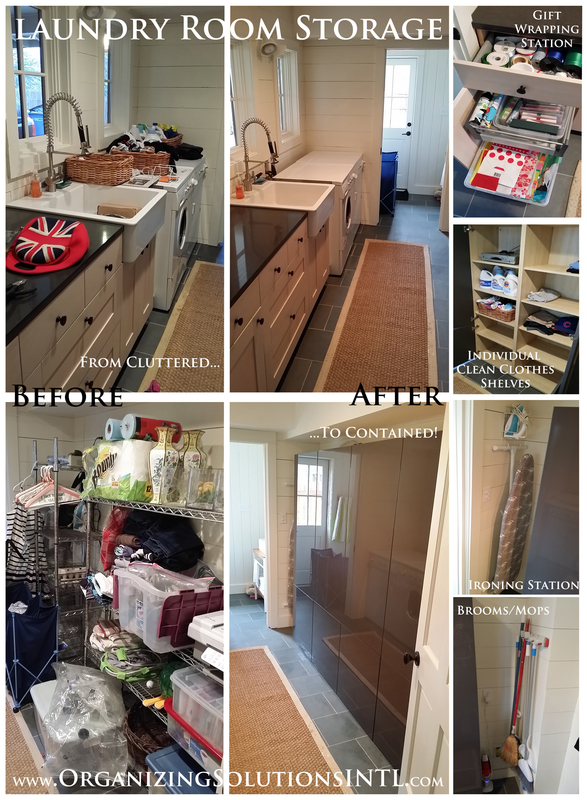 All of the laundry room specific items were put into the shelving unit and now instead of baskets on a shelf to house clean clothes, everyone gets their own shelf of clean clothes to unload each week. The basket of misc. socks was sorted out (unfortunately there were some lone sock casualties). An ironing station and a broom/mop holder were hung between the walls and cabinets. She had a bunch of gift wrapping supplies with no designated work-space, so we made a gift wrapping station with the left cabinet set. All the laundry items were put away in the shelving, and even more cabinet space is leftover to house additional storage items. Now, with a home for everything ‘laundry’, it will be a lot easier each week to “review” the room, and unload the things that don’t belong. Next Next post: Spring Cleaning! Donate, donate, donate!